Listing: Allows you to scan and list with the PDA. Empty Buy File: Let you clear the barcodes saved as buy during scanning. Program Setting: Configure this software. 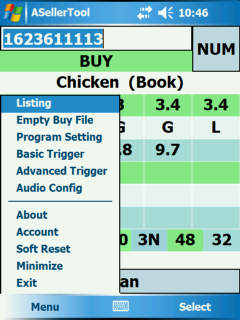 Basic Trigger: Setup pricing offer used, pricing and rank buying criteria in a default format. Advanced Trigger: Setup individual triggers with customizable pricing offers and buy signals. Audio Config: Configure audio indications to different scanning results. Account: Setup your account, display device license key and also enable or disable Hidden Mode. Exit: This will end ASellerTool program.